I always machine bind my quilts. Always. 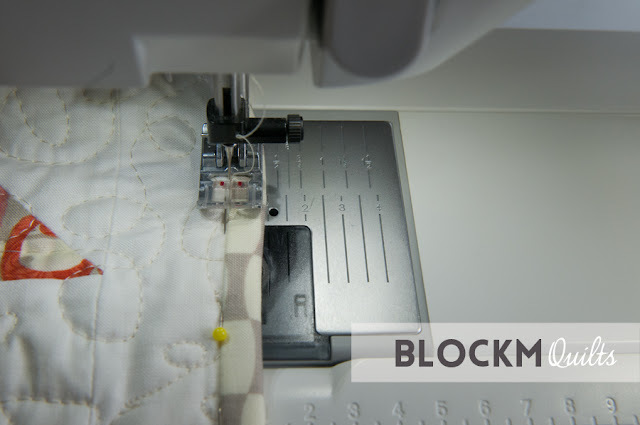 As I started to learn how to quilt I looked at tutorials on how to bind your quilts and hand binding just never appealed to me. Not that I don't like the look of it, I just don't like sewing by hand, no matter what it is, and I simply don't trust my own hand sewing abilities. So I have tried out different ways of machine binding. This one here is how I started off. But I didn't like how visible the seam was at my quilts at the front. 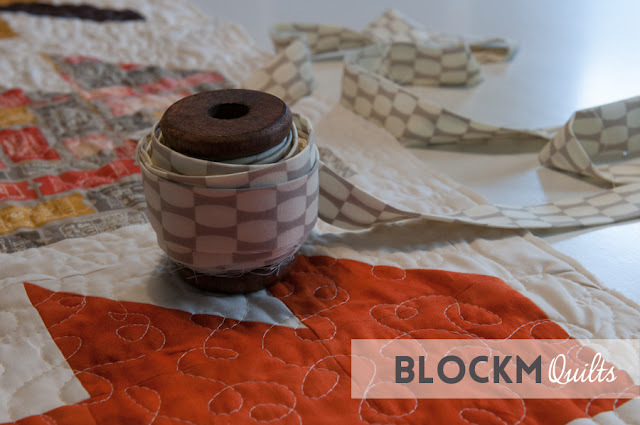 After a couple of quilts I have found a method that really works for me and that looks neat at well. 1.) First of all I secure all the edges after squaring off my quilt. I use my 1/4'' foot and sew all the way round. 2.) I roll up my binding. Little tutorial here. 3.) I attach the binding using my regular sewing foot, that is just a little bit further away from the edge than 1/4'', approx. 3/8''. Here you can see the 1/4'' seam line from squaring off the quilt, and the seam of attaching the binding. 4.) Secure the binding with pins from the front of your quilt, making sure that the binding at the back is pinned as well. 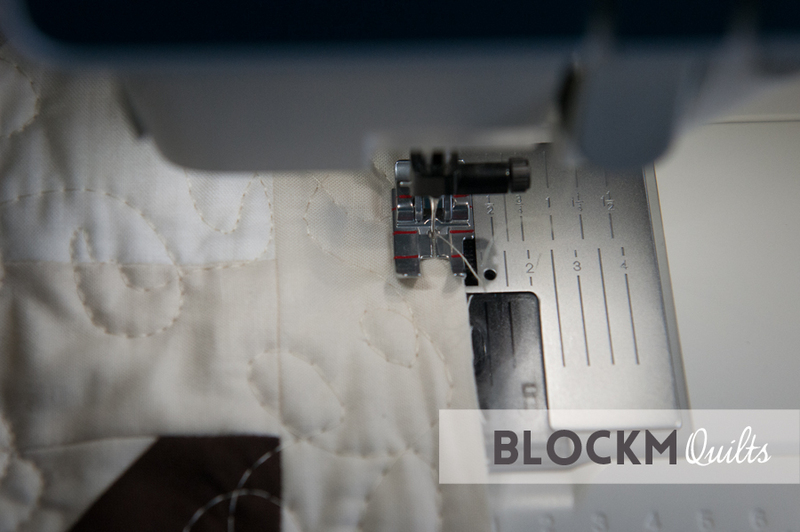 Visible here are also the two seams: 1/4'' seam from securing the quilt and the approx. 3/8'' from attaching the binding. Make sure the binding covers both seam lines. 5.) 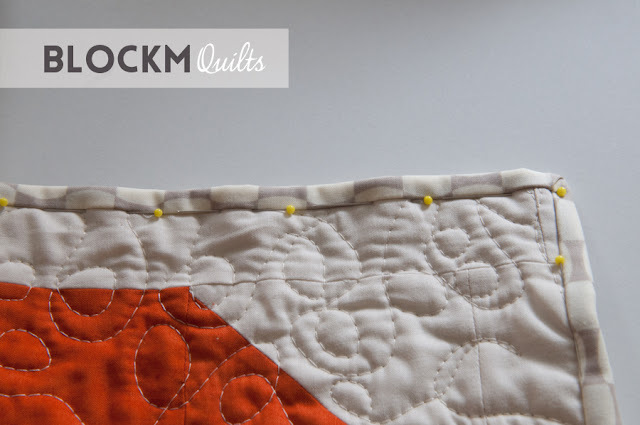 Use a lot of pins at the front of your quilt. A LOT! Basically there is pin beside pin. That ensures that all the binding is gripped and it will be entirely sewn on to the quilt. Have them facing all in one direction upwards, so that you can easily remove them while sewing along the binding. 6.) 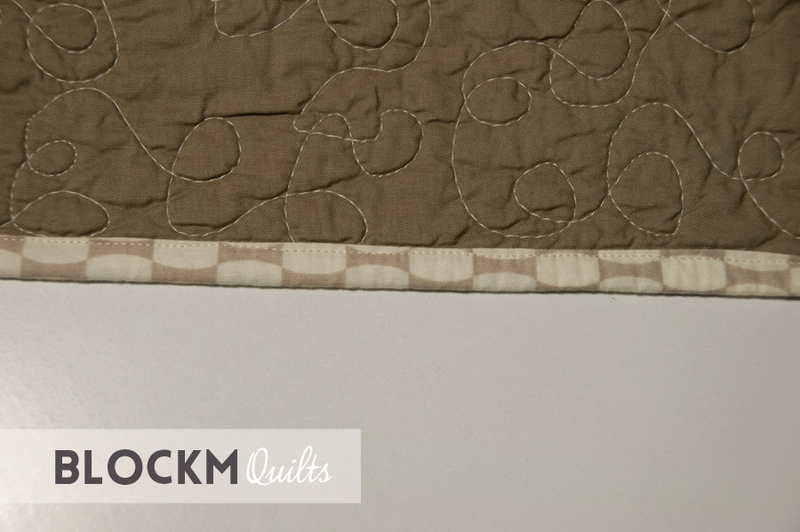 Sew the binding on from the top of your quilt, remove pins as you go. 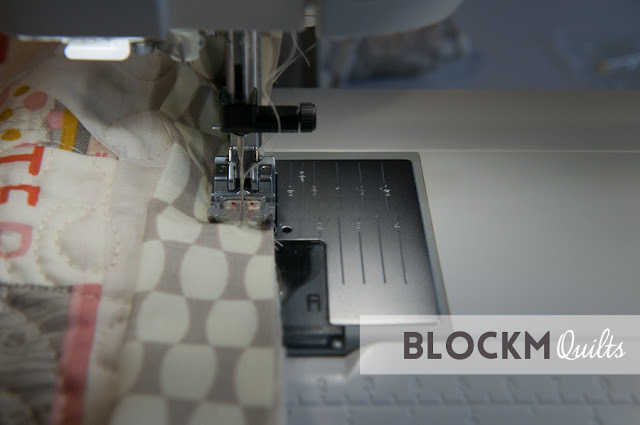 Make sure you don't sew over the pins, that could break the needle in your sewing machine! Take your time! Sewing the binding and attaching it takes me a whole afternoon, like 4-5 hours or so for a lap size quilt. You hand-sewn-binding-people are probably laughing at me know, because I could imagine that hand sewing your binding takes about the same time. 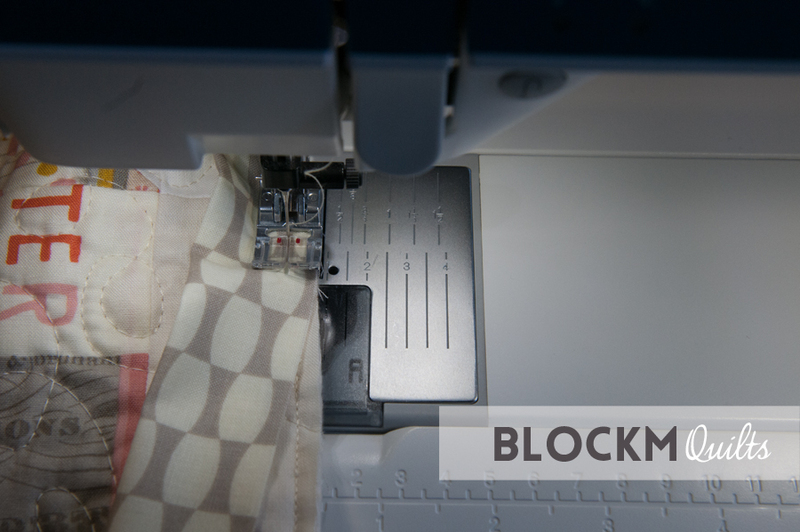 Machine binding is not fast. Preparation is key with this method. I usually use my left index finger and put it beside the binding when I sew along the binding. 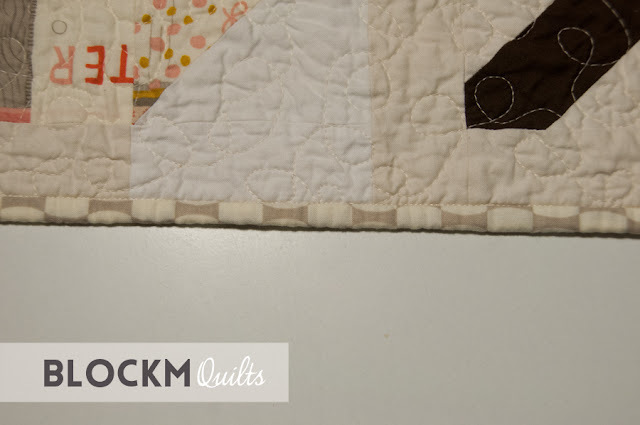 I've gotten quite good in feeling the edge of the binding through the quilt top. If I cannot feel it I pull the binding a bit across. The seam is barely visible. 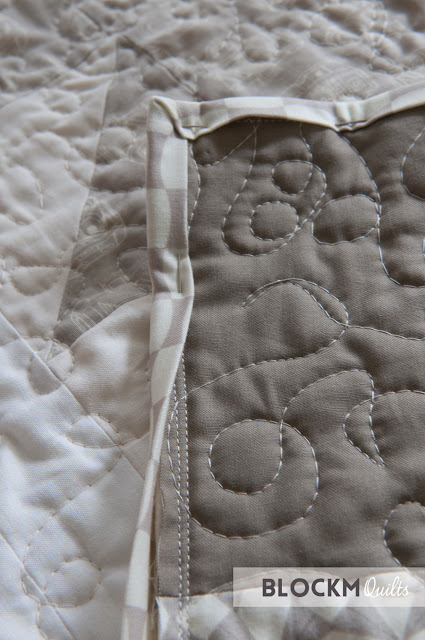 Yes, it's all beige but I have done white thread with white binding on dark quilts tops and that works, too. Sometimes I miss sections of the binding, as you cannot see the edge from the top. I used to hand sewn that left out section then, but meanwhile I just go over it again, with the machine. Yep, that's how lazy I am. 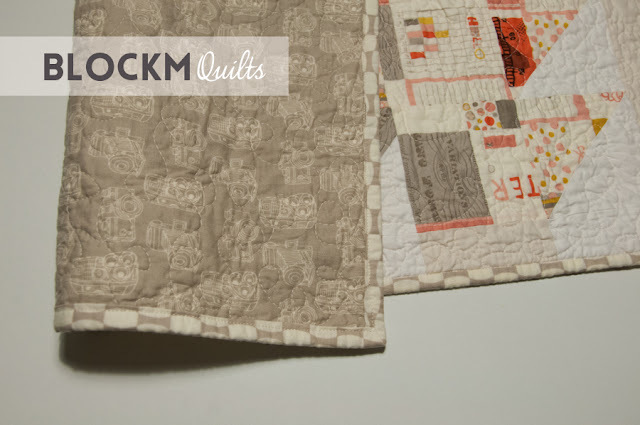 I have about two to three sections (probably 1 inch long or smaller) at every quilt where I didn't catch the binding, but that's ok with me. And I swear the 'double seam' is not visible. The corners turn out ok, I'm happy with that. All in all this is a very neat way to attach your binding. It takes practice, as everything, but I really like the sturdiness of the binding and this will definitely not come off! If you have questions about this tutorial just get in touch. da musste ich jetzt wirklich schmunzeln. Ich schaffe per Hand in 1 Stunde 2,5-3 Meter. Aber wenn Du natürlich nicht gern mit der Hand nähst, versteh ich dass. Ich mach das auch ab und zu mit der Maschine. Aber ich ärger mich immer, wenn es nicht auf beiden Seiten absolut perfekt gleich vom Rand entfernt ist. DANKE!!! Ich bin nicht alleine. Ich hasse es, das Binding mit der Hand anzunähen. Es gibt sigar einen großen Quilt, der deswegen noch rumliegt. Bescheuert, oder? Ich muss ihn mal rauskramen und endlich ein Binding annähen. *gg* bis auf die vielen Nadeln mache ich es gerne genauso wie du. Ich benutze WonderClips. Aber mir gehen dann meist mehr Stellen als dir diech die Lappen. I also do not like to sew the sewing with my hand. I also attach it with the machine or sometimes some nice MCQs do the hand sewing for me. 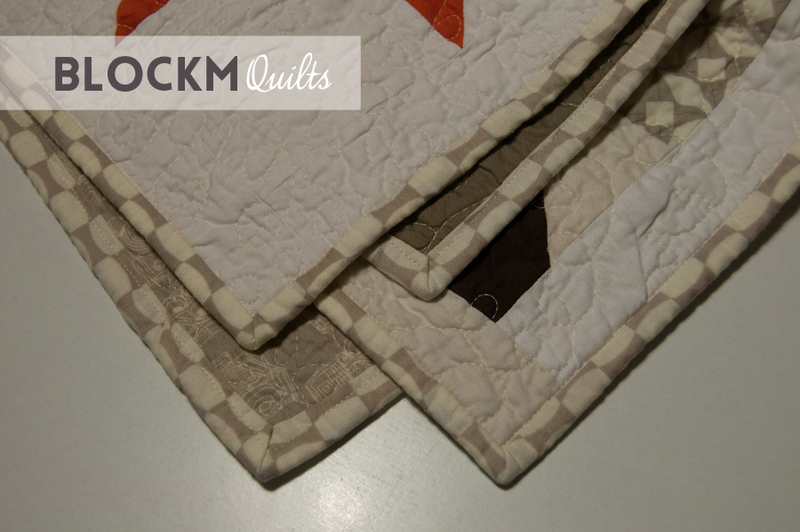 On my last quilt I attached the binding with a zigzag stitch and even with that I missed some parts of the binding. But it is no problem to go over it again.